The chief purpose of this program is to enhance the domestic research capacity in computational material science especially quantum mechanics-based ab initio electronic structure calculations and molecular dynamics simulations, through promoting exchange and collaboration among local members as well as between Taiwan and foreign members, and also through attracting more young researchers into this field. To this end, like previous years, we have organized ab initio methods study group meetings, joint experimental and theoretical workshops, mini-schools with leading international scientists as main lecturers, and also program-wide annual conference. Furthermore, to attract younger researchers as well as the experienced ones to the field of CMR and also to promote awareness of the important role in the modern scientific research played by the computation using present-day computers, we have also organized spring school ( introductory level) and summer school ( advanced level ) on first-principles computational materials research. The gatherings of this kind have provided an essential channel for fruitful discussions among members of the community, and in particular, benefit our postgraduate students and young postdocs tremendously. We have encouraged members especially young ones to attend relevant international conferences, workshops and schools. Specifically, we supported Ru-Fen Liu (postdoc. at NCKU) and Chi-Cheng Lee (Ph. D student at Tamkang Univ.) to attend. We also supported Chung-Yuan Ren and Bi-Ru Wu visited NCTS (south) last summer in order to promote the collaboration among local members. 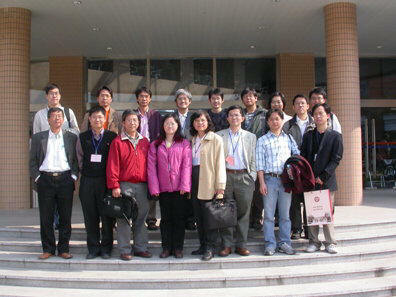 The 8 th Asian Workshop on First-Principles Electronic Structure Calculations was held in Shanghai, Oct. 31 to Nov. 2, 2005. This is a big event in the Asian community of ab initio research. This series of workshop is initiated at 1998 by Prof. K. Terakura of Japan and K. J. Chang of Korea, about 100 scientists from the Asian countries such as China, Hong Kong, Japan, Korea, India, and Taiwan, and also four to five leading experts from Europe and USA participate in this workshop. The 4 th Asian Workshop was held in National Taiwan University in 2001, and the 7 th Asian Workshop will be held in Tamkang University in 2004. We have eighteen members of this focus group participate the 8 th Asian Workshop last year. The next meeting will be held in Korea and the member of focus group on Computational Material Research will continue being active in this Asian community of ab initio research. In order to promote the international collaborations, we have invited a couple of distinguished foreign scientists to visit Taiwan for a short period. We have the following visitors from abroad in the past year : Prof. J. P. Lu from Univ. of North Carolina at Chapel Hill (USA) visited J. P. Lu, Prof. Steven Louie from University of California at Berkeley (USA) visited C. Cheng and G. Y. Guo, Porf. Ku Wei from Brookhaven National Laboratory (USA) visited H. C. Hsueh, Prof. Ferdi Aryasetianwan from AIST (Japan) and Prof. Shiwu Gao from Goeteborgs Univ. (Sweden) visited G. Y. Guo, and Prof. C. T. Chan from Hong Kong Univ. of Sci. and Techno. (HK) vistited T. C. Leung. Engineering electronic properties of CNTs through chemical functionalizations by JP Lu (Univ. of North Carolina at Chapel Hill ) , Introduction of lithium ion batteries and direct methanol fuel cells by Bing Joe Hwang (Nat'l Taiwan Univ. of Science & Technology), Design of nanocatalyst systems by CY Mou (NTU), Ab initio study of CO oxidation on Au-Ag nanoparticles by CM Chang (NDHU) Single-walled (5,3) gold and platinum nanotubes – a theoretical study by CK Yang (Chang Gung U), Ab initio investigations of some 1-D nano-materials by GY Guo (N Taiwan U), Giant Stark effect and electro-optical modulation in BN nanotubes by CW Chen (NTU), One-dimensional nanostructures: from lasing to sensing by LC Chen (NTU), Adsorption kinetics and interaction mechanism of colloidal nanoparticles onto self-assembled monolayers by Shangir Gwo (NTHU), From energy transport to medical imaging : some interesting properties of CNTs and their applications by JP Lu (Univ. of North Carolina at Chapel Hill) , Quantum effect on nanostructure by CM Wei (Academia Sinica), Work function of carbon nanotubes – a first-principles study by TC Leung ( CCU). The spring school on first-principles computational materials research – introductory level, lectured by T. C. Leung ( NCCU ), is held in National Center for High-performance Computing . The purpose of this school is to offer an introduction to the fundamentals of ab-initio density functional theory, of pseudopotentials, and large scale calculations, as well as a practical hands-on training for young students and non-specialists. The hands-on training will be based on a LINUX platform (Pentium PC's). The response from both the young students and non-specialist researchers were very positive, there were about eighty participants in each session of this spring school. Detailed information on the program of the school can be found on the CTS's web site. Time-dependent density functional theory (TDDFT) is one of the two most frequently employed methods based on the DFT scheme to study electronic excitations in many-electron systems. TDDFT mini-schools lectured by distinguished TDDFT experts from abroad will be scheduled. In order to acquire some background knowledge of TDDFT to make the best out of the coming mini-schools, we held the first study-group meeting on TDDFT for the members of the focus group. The first study group meeting on TDDFT was organized by C.Cheng and held in National Cheng Kung University. The speakers and titles are as follows: Linear response theory in TDDFT by Chi-Cheng Lee (Tamkang Univ. ), Computational approach to excited states of finite-size systems by Michitoshi Hayashi (Center for Condensed Matter Sciences), Examples of TDDFT applications by Ru-Fen Liu (NCKU) University), and The TDDFT method in octopus by Ching Cheng (NCKU). 1. Linear response and time-dependent density functional theory. 2. Quasi-particle excitations and finite-temperature many-body perturbation theory. 3. Linear response via MBPT and the possible future directions. 4. Wannier functions and strongly correlated systems. The summer school on first-principles computational materials research- advanced level, organized by C. Cheng ( NCKU) and T. C. Leung ( NCCU ), is held in National Cheng Kung University. The purpose of this summer school is to offer the audiences a deeper understanding on the fundamentals of ab-initio density functional theory, of pseudopotentials, and large scale calculations. Particular emphasis will be laid on a thorough discussion of the problems that can be solved directly with the basic code. The hands-on training will be based on a LINUX platform (Pentium PC's). There were about fifty participants in this summer school. The lecturers of the school are G. Y. Guo (NTU), Ching Cheng (NCKU), T. C. Leung (NCCU), M. H. Lee (TKU), and C. M. Chang (NDHU). Detailed information on the program of the school can be found on the CTS's web site. The ability to perform reliable simulations of molecules and solid systems with thousands of atoms has enormous payoffs in many fields, especially for the materials and pharmaceutical industries. It is well known that the computing time of currently popular electronic structure methods based on Density Funtional Theory (DFT) scale like N 2-3 , with N being the number of atoms in the simulation cell. In the last few years, much effort has been devoted to overcome this problem, and a number of methods have been developed with “ order- N ” [ O(N) ] scaling, i.e., whose computational cost scales only linearly with the number of atoms. One of the successful order N ab initio computing code is OpenMx (Open source package for Material eXplorer) developed by Dr. Taisuke Ozaki from National Institute of Advanced Industrial Science and Technology in Japan. OpenMX is a program package for nano-scale material simulations, which is designed for the realization of large-scale ab initio calculations based on a density functional theory (DFT), norm-conserving pseudopotentials, and pseudo atomic localized basis functions. In order to familiar with the principles used in the program and how they are implemented so that the program can be properly applied to the systems we want to study, the first study group meeting on Openmx was organized by C.Cheng (NCKU) and T. C. Leung (CCU) and held in National Cheng Kung University. The speakers and titles are as follows: Introduction of C Language by Y. T. Lu (NCKU), Overview of Openmx by G.Y. Guo (NTU), Comparison on the magnetic properties of oxides calculated with Openmx and VASP by H. C. Hsueh (Tamkang Univ. ), Electronic and geometric properties of metal cluster calculated with Openmx by C. M. Chang (NDHU), Electronic and geometric properties of metal surface calculated with Openmx by J. P. Chou (CCU), Electronic and geometric properties of silicon related system calculated with Openmx by S. F. Huang (NTU), and Comparison on the geometric properties of carbon and silicon related material calculated with Openmx and VASP by S. F. Tsay (NSYU). Ab initio density functional theory (DFT) with local density approximation (LDA) or generalized gradient approximation (GGA) has been applied to study many physical properties of a wide variety of solids with tremendous success. Nevertheless, the ground-state based nature of the conventional DFT method has difficulties in tackling electronic excitations in solids. An alternative method which is comparatively simpler in formalism, is the time-dependent (TD) DFT. TD-LDA has great success in describing excitations in finite systems such as nanoclusters. In this mini-school, two of the leading figures in the field will give four lectures: on the fundamentals, applications and also beyond TDDFT. The mini-school was organized by G. Y. Guo and held in National Taiwan University. The speakers and titles are as follows: “ Introduction to Time-dependent Density Functional Theory ”, and “ GW-Dynamic Mean Field Theory (DMFT): An Overview “ by Prof. Ferdi Aryasetianwan from AIST (Japan) and “ TDDFT in real time, introduction and perspectives “ and “ Collective Excitations in Nanostructures (Nanoplasmons) ” by Shiwu Gao from Goeteborgs Univ. (Sweden). 1. Photonic crystals: The basics. 2. Guided waves and photonic crystal optics. 3. Meta-materials and double negativity. 4. Manipulating materials using light. The research activities of the CMR community in Taiwan will be focused on the following four areas. In the meantime, we will also be flexible and open-minded concerning any specific projects and theoretical methods. (1) The effect of the overlayer on the surface reconstruction: Recently, F.K. Men of Chung Cheng University studied system of Au/Si(111) using scanning tunneling microscopy. It is well known that the Au adatoms will induce a (5x2) reconstruction of the Si(111) surface. Many experimental and theoretical efforts have been used to study the surface, the structure of the surface remains elusive. In this part, we want to investigate the structure of (5x2) Au/Si(111) using first principles calculations. (2) The effect of the overlayer on the field emission current: In this part, we will address the properties of thin magnetic layers grown on top of various orientations of the refractory metal surface. We will study the field emission current from the magnetic layers using first principles calculation. The dependence of the spin polarization on the orientation of the substrate will be investigated. These studies will shed some light on whether these systems may be used a source of spin polarized electrons in field emission. The purpose of this project is primarily to understand the mechanism of various phenomena occurring in magnetic materials that are crucial to the applications in spintronics (e.g., exchange biasing), through quantum mechanical electronic structure calculations and model simulations. It is also intended to use our theoretical expertise to make quantitative predictions which could be valuable guides to the experimental colleagues in Taiwan (e.g., searching for new half-metallic magnets). The magnetic materials we want to study include magnetic multilayers and ultrathin films, magnetic junctions, magnetic fine particles as well as bulk systems. Specifically, we want to focus on the following topics. (1) First-principles local spin density functional theory of structural stability, magnetism, magnetic anisotropy and magnetostriction of artificially made nanometer films that are used in magneto-electronic devices (e.g., half-metallic metal oxides and Heusler alloys); (2) Heisenberg-type model simulation and first-principles electronic structure theory of non-collinear magnetism and exchange coupling in magnetic trilayers and spin valve systems in order to understand the exchange biasing, one of the crucial issues in spintronics; (3) First-principles electron transport theory of magnetoresistance and spin-dependent tunneling through magnetic trilayers and spin valve systems; In particular, various factors (e.g., interfacial electronic density of states) that affect spin-dependent transport will be investigated. (4) Theoretical search for new half-metallic magnets especially half-metallic transition metal oxides. Using the Kohn-Sham orbital calculated from Planewave Pseudopotential scheme (in this particular project, CASTEP is used), one can evaluate optical matrix elements which can be used to calculate linear optical quantities, such as the anisotropy of the reflective index of a crystal, and non-linear optical quantities, such as second order susceptibility. Both are important in non-linear optical material design for Second Harmonic Generation of laser beam. With the ab initio DFT method in combination with PDOS local analysis and wave-function cutting approach, we are able to identify the specific molecular fragment in the crystal which giving largest contribution to the calculated linear and non-linear optical quantities. There is therefore potential for this method to be used not only in fundamental research but also for material design. The above mentioned method has been successfully applied on borate series NLO crystals. Current research direction is also heading toward using the same kind of approach to investigate the first order NLO effect occurs in organic molecules. In which chemists has proposed a push-pull model to describe how molecular structure affects NLO property. Full quantum mechanical calculation described in this project will allow one to go beyond two level or few level models and give a more detail insight into the NLO mechanism of organic molecules. 1. “ Measurement of current-induced local heating in a single molecule junction”, Huang ZF, Xu BQ, Chen YC, et al. , Nano Lett. 6, 1240 (2006). 2. ” Magic structures of H-passivated <110> Silicon nanowires”, Tzu-Liang Chan, Cristian V. Ciobanu, Feng-Chuan Chuang, Ning Lu, Cai-Zhuang Wang and Kai-Ming Ho, Nano Lett. 6, 277 (2006). 3. “ Charge-orbital ordering and verwey transition in magnetite measured by resonant soft X-ray scattering “, Huang DJ, Lin HJ, Okamoto J, Chao KS, Jeng HT, Guo GY, Hsu CH, Huang CM, Ling DC, Wu WB, Yang CS, Chen CT, Phys. Rev. Lett. 96, 096401 (2006). 4. “ Orbital ordering and Jahn-Teller distortion in perovskite ruthenate SrRuO3”, Jeng HT, Lin SH, Hsue CS, Phys. Rev. Lett. 97, 067002 (2006). 5. “ Highly spin-polarized field emissions induced by quantum size effects in ultrathin films of Fe on W(001)”, Li B, Leung TC, Chan CT , Phys. Rev. Lett. 97, 087201 (2006). 6. "Oxygen-Driven Unzipping of Graphitic Materials" , Je-Luen Li, Konstantin N. Kudin, Michael J. McAllister, Robert K. Prud'homme, Ilhan A. Aksay and Roberto Car, Phys. Rev. Lett., 96, 176101 (2006), featured in News & Views, Nature, 414, 818 (2006) . 8. “ Magic numbers of atoms in surface supported planar clusters”, Y. P. Chiu, L. W. Huang, C. M. Wei, C. S. Chang and Tien T. Tsong, Phys. Rev. Lett. (accepted 2006). 9. “ Sharp infrared emission from single-crystalline indium nitride nanobelts prepared using guided-stream thermal chemical vapor deposition”, Hu MS, Wang WM, Chen TT, Hong LS, Chen CW, Chen CC, Chen YF, Chen KH, Chen LC, Adv. Funct. Mater. 16 , 537 (2006). 10. “ Atomic-scale deformation in N-doped carbon nanotubes”, Sun CL, Wang HW, Hayashi M, et al., J. Am. Chem. Soc. 128 ,8368 (2006). 11. “ Percolation transition and colossal magnetoresistive effects in a complex network”, Ju S, Cai TY, Guo GY, et al., Appl. Phys. Lett. 89,. 082506 (2006). 12. “ Comparison of the electronic structures of Zn1-xCoxO and Zn1-xMgxO nanorods using x-ray absorption and scanning photoelectron microscopies”, Chiou JW, Tsai HM, Pao CW, Kumar KPK, Ray SC, Chien FZ, Pong WF, Tsai MH, Chen CH, Lin HJ, Wu JJ, Yang MH, Liu SC, Chiang HH, Chen CW, Appl. Phys. Lett. 89, 043121 (2006). 13. “ Anomalous blueshift in emission spectra of ZnO nanorods with sizes beyond quantum confinement regime”, Chen CW, Chen KH, Shen CH, et al., Appl. Phys. Lett. 88 , 241905 (2006). 15. “ Gate-controlled spin splitting in GaN/AIN quantum wells”, Lo I, Wang WT, Gau MH, Tsai JK, Tsay SF, Chiang JC, Appl. Phys. Lett. 88 , 082108 (2006). 16. “ Electronic and magnetic properties of the Ag-doped Fe3O4 films studied by x-ray absorption spectroscopy”, Liu SH, Tsai HM, Pao CW, Chiou JW, Ling DC, Pong WF, Tsai MH, Lin HJ, Jang LY, Lee JF, Hsu JH, Wang WJ, Hsu CJ, Appl. Phys. Lett. 89 , 092112 (2006). Appl. Phys. Lett. 89 , 082511 (2006). 18. “ Comparison of the electronic structures of Zn1-xCoxO and Zn1-xMgxO nanorods using x-ray absorption and scanning photoelectron microscopies”, Chiou JW, Tsai HM, Pao CW, Kumar KPK, Ray SC, Chien FZ, Pong WF, Tsai MH, Chen CH, Lin HJ, Wu JJ, Yang MH, Liu SC, Chiang HH, Chen CW, Appl. Phys. Lett. 89 , 043121 (2006). 19. “ Electronic structures of group-III-nitride nanorods studied by x-ray absorption, x-ray emission, and Raman spectroscopy”, Pao CW, Babu PD, Tsai HM, Chiou JW, Ray SC, Yang SC, Chien FZ, Pong WF, Tsai MH, Hsu CW, Chen LC, Chen CC, Chen KH, Lin HJ, Lee JF, Guo JH, Appl. Phys. Lett. 88 , 223113 (2006). J. Phys. Chem. B 110,: 2529 (2006). 23. “ Transition between icosahedral and cuboctahedral nanoclusters of lead”, C.M. Wei, C. Cheng, C. M. Chang, J. Phys. Chem. B, accepted (2006). 24. “ Observation of single oxygen atoms decomposed from water molecules on a Si(111)-7x7 surface”, Lo RL, Chang CM, Hwang IS, et al., Phys. Rev. B 73 , 075427 (2006). 25. “ Effect of atomic geometry on shot noise in aluminum quantum point contacts”, Yao J, Chen YC, Di Ventra M, et al., Phys. Rev. B 73 , 233407 (2006). 26. “ Conserved spin and orbital angular momentum Hall current in a two-dimensional electron system with Rashba and Dresselhaus spin-orbit coupling”, Chen TW, Huang CM, Guo GY, Phys. Rev. B 73 235309 (2006). 27. “ Robust half-metallic antiferromagnets LaAVOsO(6) and LaAMoYO(6) (A=Ca,Sr,Ba; Y=Re,Tc) from first-principles calculations”, Wang YK , Guo GY, Phys. Rev. B 73 , 064424 (2006). 28. ” Heterogeneous energy landscapes of individual luminescent conjugated polymers”, Liang JJ, White JD, Chen YC, Wang CF, Hsiang JC, Lim TS, Sun WY, Hsu JH, Hsu CP, Hayashi M, Fann WS, Peng KY, Chen SA, Phys. Rev. B 74, 85209 (2006). 31. “ Magnetically induced variations in phonon frequencies “, Lee JH, Hsue YC, Freeman A J, Phys. Rev. B 73, 172405 (2006).